The Advanced Ovarian Cancer/Neoadjuvant Chemotherapy GUIDELINES Pocket Guide is based on the latest guidelines of the American Society of Clinical Oncology and was developed with their collaboration. It contains graded recommendations for assessment and treatment of advanced ovarian cancer including a management algorithm and risk factors for perioperative complications. Nearly 75% of women with ovarian cancer are diagnosed with advanced stage disease (International Federation of Gynecology and Obstetrics [FIGO] IIIC or IV) at presentation. 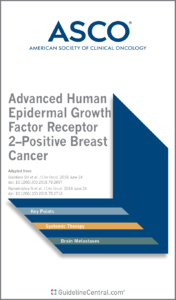 Recently two randomized clinical trials (RCTs) demonstrated that neoadjuvant chemotherapy (NACT) was noninferior to primary cytoreductive surgery (PCS) with respect to progression-free and overall survival and resulted in a lower incidence of treatment-related morbidity and mortality. However, both trials have been criticized because the median overall survival, mean operative time, and rates of optimal cytoreduction were lower than expected. This Guideline provides guidance to clinicians regarding the use of neoadjuvant chemotherapy and interval cytoreduction among women with stage IIIC or IV epithelial ovarian cancer. The use of other tools to refine this assessment may include laparoscopic evaluation or additional radiographic imaging (eg, [18F]fluorodeoxyglucose positron-emission tomography [FDG-PET] scan or diffusion-weighted magnetic resonance imaging [MRI]).